Eco Move Rent offers scooter rental Rome and is located across the road from the building of Funny Palace. 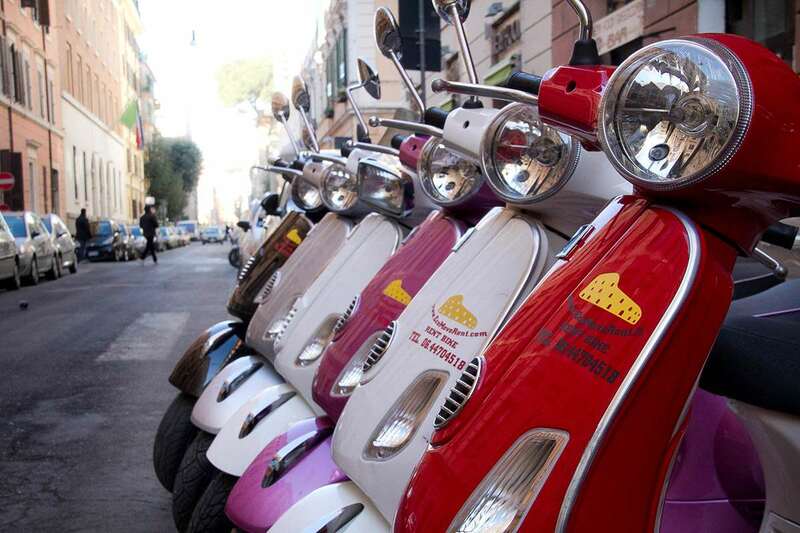 What better way to see the Eternal city than from the wheels of a vintage vespa or even one of the modern versions. Its only for the brave however! Otherwise for those who wish not to tackle the streets of Rome at the controls, Eco Move Rent offers a variety of scooter tours in which you can be the passenger on the back of the scooter alongside a local tour guide stopping at some of the major monuments to learn the history. Its a great way to have some fun and perfect for those on a short visit with lots to see. As well as scooter rentals and tours Eco Move Rent also provides tours in the famous Fiat 500. Along with motorized options you can also rent a bike at the shop for the day or for a few days if you like. Rome does not have cycle lanes throughout the city but you can make your way to the many parks for a ride. Its only a 15 minute bike ride from Villa Borghese Rome's central and most famous park where you can ride around at ease, take a picnic or head down to Pincio which offers spectacular views of the city overlooking Piazza del Popolo and with St Peter's Basilica in the distance. Its the perfect spot to see the sunset. Scooter Rental Rome - So head into the Eco Move Rent office and enquire about the options. You will need a valid driving ID and some experience driving scooters / motorbikes is highly recommended. For those of you staying at Funny Palace ask at the reception and you can receive a discount on all rentals and tours made through Eco Move Rent. For further information about the tours and rentals on offer you can have a look at the Eco Move Rent website www.ecomoverent.com .